Argentina's first domestic geosynchronous communications satellite. Communication satellite built by INVAP (prime); Thales Alenia Space (payload) for AR-SAT SA, Argentina. Launched 2014. Used the ARSAT-3K bus bus. Status: Operational 2014. First Launch: 2014-10-16. Last Launch: 2015-09-30. Number: 2 . Gross mass: 2,985 kg (6,580 lb). 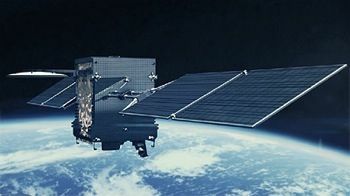 First launched equipped with 24 Ku-band transponder. ARSAT 2 Communication satellite built by INVAP (prime); Thales Alenia Space (payload) for AR-SAT SA, Argentina. Launched 2015. Used the ARSAT-3K bus bus. ARSAT 3 Communication satellite built by INVAP (prime); Thales Alenia Space (payload) for AR-SAT SA, Argentina. Used the ARSAT-3K bus bus. ARSAT satellite Argentinian satellite bus used on the Arsat series. Family: Communications. Country: Argentina. Engines: S400. Launch Vehicles: Ariane 5, Ariane 5ECA. Launch Sites: Kourou ELA3. Bibliography: 6356. 2014 October 16 - . 21:44 GMT - . Launch Site: Kourou. Launch Complex: Kourou ELA3. LV Family: Ariane 5. Launch Vehicle: Ariane 5ECA. ARSAT-1 - . Mass: 2,985 kg (6,580 lb). Nation: Argentina. Class: Communications. Type: Communications satellite. Spacecraft: ARSAT-3K. USAF Sat Cat: 40272 . COSPAR: 2014-062B. Apogee: 35,793 km (22,240 mi). Perigee: 35,780 km (22,230 mi). Inclination: 0.0600 deg. Period: 1,436.09 min. Argentina's first domestic geosynchronous communications satellite. Used a domestic satellite bus with 24 Ku-band transponder. Stationed in geosynchronous orbit at 72 deg west..
2015 September 30 - . 16:30 GMT - . Launch Site: Kourou. Launch Complex: Kourou ELA3. Launch Vehicle: Ariane 5. ARSAT-2 - . Mass: 2,900 kg (6,300 lb). Nation: Argentina. Class: Communications. Type: Communications satellite. Spacecraft: ARSAT-3K. USAF Sat Cat: 40941 . COSPAR: 2015-054B. Apogee: 35,792 km (22,240 mi). Perigee: 35,782 km (22,233 mi). Inclination: 0.0600 deg. Period: 1,436.10 min. Argentinan indigenous communications satellite. 26 Ku-band and 10 C-band transponders..